There’s hardly anyone who doesn’t know about this app yet especially for Facebook users and those who own either Android or iOS gadgets. But in case there’s still someone not in the know, Candy Crush is a game app developed by game development company, King, and was first released as a Facebook application on April 12, 2012 and later on introduced for smart phones and tablets (iOS) on November 14, 2012 and on December 14, 2012 for Android. The game records over 46 million monthly users and had already been downloaded and installed by over 500 million users across all platforms as of November 2013. This video game is based on a match three puzzle concept where users match three or more similar candies in order to free them up and advance towards the next game level. To move the candies, players just have to swipe the items either horizontally or vertically. Candies include the red jelly bean, the orange lozenge, the yellow lemon drop, the green square, the blue lollipop head, and the purple cluster. There are also special candies which produce a certain effect when combined against each other or with regular candies. Some special candies include striped candies, wrapped candies, and colour bombs. The effects special candies produce include clearing an entire row or column. Combining two special candies produce greater effects than when used by themselves. For example, two colour bombs clear all candies on the puzzle board. Two striped candies on the other hand will create a blast which simultaneously clears both horizontal and vertical rows. Wrapped candies switched will result to a double 8×8 explosion. Meanwhile, a colour bomb with a striped candy transforms similar coloured candies into striped ones and clears rows (horizontal or vertical). A wrapped candy switched with a striped candy produces a large candy which absorbs everything in a 3×3 square and consequently clears out three horizontal and vertical rows. A colour bomb switched with a wrapped candy detonates candies similar to the colour of the wrapped candy. A random colour will detonate again once the board cools down. Tiffi or short for Toffette is the blonde girl with pigtails who is also the main character. She is introduced in the first episode (Candy Town) and appears throughout the game through tutorials, level introductions, and helps solve player’s problems. Mr. Toffee is the tall man with orange hair and introduces gamers to the Candy Crush Saga through a tutorial and power up tips. Easter Bunny introduces Candy order levels. Players are given five lives which are reduced every time they fail a level. A player needs at least one life to play. Once the lives are depleted, one needs to wait for at least 30 minutes for a life to regenerate. They can also ask Facebook friends for extra lives or purchase more through Facebook credits or money paid via credit card. Game progress can be achieved by completing each level which can be through target scores, jelly, dropping ingredients, time, and candy order. Each level has a corresponding episode. As per Wikipedia, the Facebook version has 515 levels while the Candy Crush Saga version (for phones and tablets) has 485. Most levels are playable only after unlocking the succeeding episodes. Upon clearing level 35, players are required to unlock the subsequent levels. The same follows for every 15 levels thereafter. Levels can be unlocked by paying or through the help of Facebook friends. On the phone and tablet version, most levels are unlocked after every three levels completed but only when not connected to Facebook. After logging online, the progress is synced between the downloaded app and the Facebook app. There are also instances where a player must wait for 24 hours before playing the next quest. Dreamworld, with 65 levels as of January 7, 2014, was introduced on November 27, 2013 where Tiffi was flown by an owl named Odus to this land after she fell into deep sleep after getting tiresome helping mascots. Obstacles are present throughout all levels to add more challenge for players. Some obstacles include the chocolate, candy bombs, tornadoes, chocolate spawners or fountains, mystery candy, marmalade, meringue, chameleon candies, licorice swirls, and many more. Chocolate attempts to slowly fill the game board. Candy bombs on the other hand require players to get the same colour (three in a row) before the special timer reaches zero, initiating a bomb to explode and ending the game. Tornadoes destroy random spaces on the board. Chocolate spawners or chocolate fountains create chocolates and swallow any candy within its reach. A chocolate is created for every move lest the players break them during a switch. Mystery Candy features regular colours but are elliptical shaped with a question mark and provide special candies, boosters, or obstacles. Charms are more expensive than boosters and can be utilized to purchase additional lives. There are additional techniques (which we don’t encourage) which can be used when playing the game. They can be considered cheating in a way. 🙂 One of which include advancing the device’s time and date in order for the game to detect that 24 hours have already passed, thereby, enabling the player to continue playing the app without having to wait for a full 24 hours (see levels section). So far, there had been no news of any sequel to this game. If you don’t have Candy Crush on your iPhone or iPad yet, click here for its iTunes page. Alternately, visiting the developer’s page, King, provides download links for Google Play (Android), App Store (Apple iOS), Kindle Fire, and Facebook. 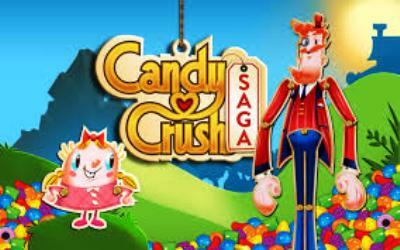 See http://about.king.com/games/candy-crush-saga. This entry was posted in Apps, How To's, iOS, iPad, iPhone and tagged candy crush. Bookmark the permalink.